'The Guildhall is a modern building, and a most interesting specimen of modern architecture, in which the architect has endeavoured to combine the most heterogeneous principles! The poor man, Mr Eveleigh,, was not, indeed, so much to blame, as the directors of the corporation at that period, in employing one so utterly unfit to erect a public edifice, so utterly ignorant as he has shown himself to be, of the first rules of architecture. It will long remain a disgrace to the town; for the expense of erecting it precludes us from hoping that it will, at any very early period, be removed, it having cosy between six and seven thousand pounds. The stigma will, indeed, principally fall on those who were concerned in its erection, and the name of Eveleigh will be handed down to posterity as eminent for folly and presumption. 'The building consists of a hall, grand jury room, and a committee room, on the first floor, with a large room and a store room over them. Below are a range of kitchens, and other appendages, used on public occasions. These rooms contain some good portraits of a few of our sovereigns, viz. Charles II, James II, Anne, George Prince of Wales, the present King's father, the present Prince of Wales; and of the following illustrious personages, Sir Francis Drake, and the Duke of Marlborough. The public business of the town is of course held in these rooms, so that there is a constant scene of bustle; sometimes from common halls or committees of the commonalty, at others the sitting of magistrates, deputy lieutenants, commissioners of taxes, commissioners of pavement, trustees of turnpikes, &c.
'It may be useful to the inhabitants to know that the commissioners of appeal under the property tax act are: Robert B Remmett MD, Robert Fuge, W Woolcombe MD, Thomas Cleather, Philip Langmead, J Clark Langmead, and Edmund Lockyer, Esquires, that their meetings are generally held on Tuesdays and Fridays, at eleven o'clock; but that information of them may always be obtained at Mr Whiteford's office, Frankfort Place. 'Here likewise is the central watch-house in the town, where the keys of the town engines are kept, together with buckets, ladders, and instruments useful in preventing fire; in case of an alarm of it, therefore, persons should immediately run to the watch-house. The reason why the Corporation came in for such criticism was that the new Guild Hall was erected on the site of the Jacobean Guild Hall, and the shape of the triangular site was not really suitable for such a prestigious building. Presumably the authors were inferring that if a different, larger site had been selected by the Corporation then Mr Evelegh just might have come up with a better design. 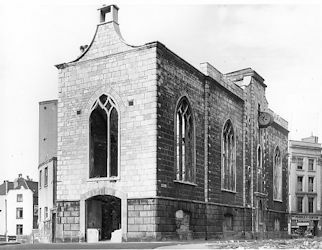 Following the demolition of the Jacobean Guild Hall, the foundation stone of the new one was laid on May 8th 1799 and the Guild Hall was opened the following year. viewed from the west end, 1944. © National Monuments Record (RCHM(E)). 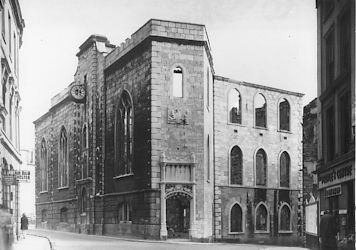 The old Guild Hall viewed from the east end, showing the Fire Engine Station, October 1943. Built at a cost of £7,000, it was constructed mainly of limestone but with granite pinnacles taken from the previous building. Beneath the illuminated clock was the main entrance which led up to the great hall. On either side of the doorway were the police offices and cells. The latter were said to be totally inadequate by 1810 although it was to be forty years before they were replaced by the new Borough Prison. The building also included the Council Chamber, the Town Clerk's office, a library, the magistrate's room and waiting rooms for witnesses. A Mr Isable was the mason responsible for the construction work, while others in the team were Mr Alger, painter and glazier, and Mr Drew, the carpenter. The only accident during the construction was to Mr Drew's son, who fell from the roof and broke his thigh. The building was very quickly condemned as: 'inconvenient as a guildhall, unsuited as a mayoralty house, inadequate as a prison and absurd as a market'. It is recorded that in the 1860s the Borough's scarlet fire engine could be seen in the open archway at the eastern end of the building. It had a steam pump, brass boiler and a copper funnel. The horses stood close by with their harnesses suspended above them so they could be lowered quickly into position. A painting of King William IV in the uniform of Lord High Admiral adorned the Council Chamber. It had been purchased privately by the Mayor, Mr J Burnell, and at the Town Council meeting on Wednesday May 2nd, he presented it to the Council specifically for the Council Chamber. When the current Guild Hall was opened in 1874, this building lay idle until 1876, when it was opened as the new Free Library and Reading Rooms. The conversion was carried out by Mr Robert Stanlake, a Plymouth builder. From 1910 onwards, when the present Library building at Drake Circus was opened, Evelegh's old Guild Hall was used by the City Treasury and Stores Officer. Consequently, when it was bombed during the raids of 1941 the City lost all its stores records and Rate Valuation lists. By February 1945 the building had been demolished.